It is a kind of revolution, something that so far has not existed yet. There is no laser distance meter which is comparable. The Leica Disto S910 is brand new. Already the label in conjunction with the letter “S” shows that this measuring tool is something special. Otherwise it would certainly get the usual letter “D”. The only exception is the Disto X310, whose name may derive from BMW’s SUVs with the letter “X” and that may point to the special protection against dust, water and bumps. Perhaps the “S” of the S910 is also a parallel to automobiles. The letter S reminds us of the most luxurious and best equipped vehicles carrying a star as brand logo. This comparison is justified as the next chapters will show. 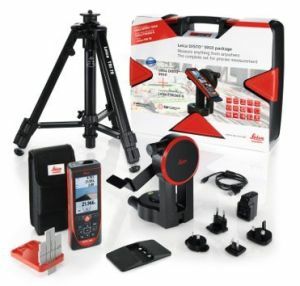 To use the full power and full function you should choose the “Leica Disto S910 Kit Laser Distance Measurer Pro Kit” that includes the Disto S910, the Leica tripod TRI70, the tripod adapter FTA 360-S and also a sturdy carrying case to protect and transport the measuring equipment. P2P is the abbreviation for point to point and that explains the revolutionary new type of measurement. If the smart base is used, the S910 can measure the distance between any two points. Just simply start from one position to measure the distances to the two target points. These can be inaccessible or even without visual contact. The distance between the two target points can be calculated from the distances between the own position and the target points and the horizontal and vertical angles. 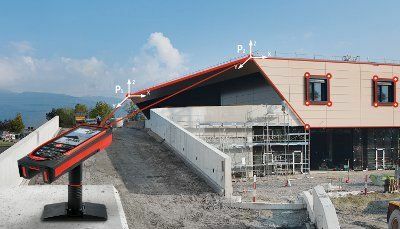 The SmartBase enables measurements of horizontal angles of 360° and vertical angles between -40° and 80°. This technology expands the possibilities for measurements with laser distance measurers to a much wider field. 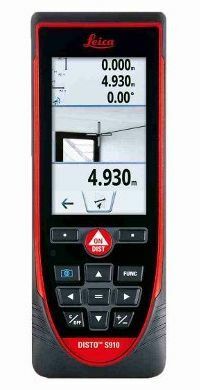 You can measure areas of facades or roofs, or simply calculate distances between points without visual contact. Of course, the integrated digital 4x zoom makes long distance measurements much easier. Other Leica distance meters use the same kind of zoom that makes measurements in bright areas or sunshine possible. It is obvious that such measurements get better results using the tripods TRI 70 or TRI 200 and the adapter FTA 360 S. These accessories support the precise aiming over long distances. Many users have been waiting for these functionalities as they save effort and money in many complicated measuring jobs. When it comes to transferring data you have more options than with any other rangefinder. Another new feature is saving points in the DXF format. This file format is widely used and is, for example, used by all CAD programs. The measured points are recorded in their relations between each other and in relation to the focal point. Automatically an elevation, an allowance and the three-dimensional representation are generated. If the camera was used during measurement, an image for each assignment of the measured points is made. As a further innovation the data transmission ca use the wireless standards. So the Disto S910 can be connected directly to a laptop, notebook or tablet. In this way a lot of points can be measured and transmitted without limit. In addition, the data can be transferred directly to an allowance program which simplifies and accelerates the work process. The S910 copes with the “classic” Bluetooth interface, as we already know from other current Leica DISTOs. So you can use the free app “Leica DISTO Sketch” for Android tablets and smartphones as well as Apple devices. The DISTO S910 offers everything that the previous top model D810 can. The S910 also shares the touchscreen functionality with the D810. Anyone who can use a smart phone gets along with the S910 quickly. The measuring range is between 5 cm and thanks to the X Power Range Technology 300 meters. The certification according to the ISO standard 16331-1 is almost self-evident for this laser distance meter. 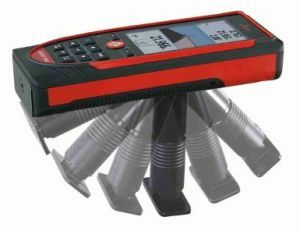 The tilt measurement is carried out between 0 and 360 degrees. At first glance, the price of the S910 is scaring. However, the price respects the enormous performance and unique functionality. No other laser distance meter offers as much functionality and possibilities. Compared to the workload and acceleration of complicated measurements there is potential for big cost savings. So the Leica Disto S910 pays off quickly if it is frequently used. For example measuring a ventilation system at an inaccessible ceiling is one strength of the S910. We are sure: The Leica Disto S910 is the best laser distance meter ever! The Leica DISTO S910 is brand new; you can order the most innovative rangefinder via internet. By the way, we will complete this review. A measuring instrument with so many features and options cannot be tested and reviewed in a short time. If you are not convinced immediately of the S910 , you come back to this review in a few days.